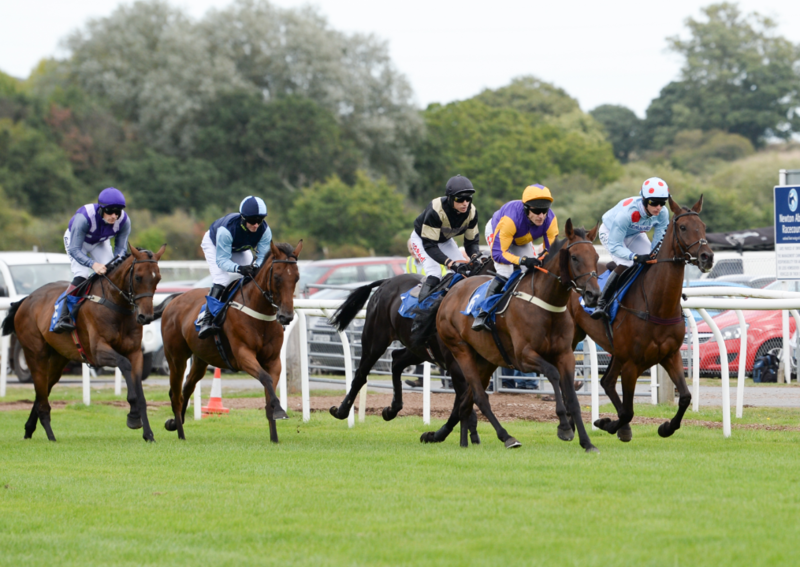 There was a dramatic finish to the feature race at Newton Abbot yesterday as Timeforben, runner-up in her previous two starts, overcame the intervention of a loose horse to land the £21,500 newtonabbotracing.com Handicap Hurdle for trainer David Pipe and jockey Tom Scudamore. It was regular front runners Kings Lad and Lord Topper, both seeking hat-tricks, who set the pace but, turning for home to face up to the final two jumps, Timeforben had joined the fray, going much the best of all the runners. It was here that Beneagles, who had fallen at the second flight, was running loose and cut across the field, hampering favourite Whataknight, who had moved into third place ready to mount a challenge. Fortunately for Timeforben, she was clear of the trouble and ran on well to beat Kings Lad, who was returning after a lay-off and wind surgery and could go one better next time from his current handicap mark. Leapaway, a winner of his last four races, was favoured by the conditions of the opening PKF Francis Clark “National Hunt” Novices’ Hurdle over two and a quarter miles and was sent off the 1-10 favourite to score again for Minehead trainer Philip Hobbs. Held up early on by Tom O’Brien, he moved closer to leader Troy Dee Knee with a circuit to go, taking up the running after jumping the third-last flight to coast home an easy 13 length winner from Pokari, who could make no impression over the last two hurdles. Roll The Dough looked to have a good chance of making it a quick double for Hobbs in the following Book Thomas Cook At Peter Goord Travel Handicap Chase over an extended two and a half miles. He had been raised 6lbs for his defeat of On Demand at the last meeting, sharing top-weight with River Of Intrigue, lightly-raced since joining the Fergal O’Brien stable from Nicky Henderson a year ago. Ridden by conditional jockey Sean Houlihan, Roll The Dough took up the running from early leader Ruby Russet at the fourth-last fence and came into the home straight with a clear lead. He started to idle out in front as Jonagold, whose jockey had lost his stirrups as the saddle slipped at the water jump, made relentless progress over the last two fences, with the gap shrinking to two lengths at the line. Odds-on favourite Cotton Club tried to make all the running in the Newton Abbot Racecourse On Facebook Selling Hurdle, but was struggling between the last two flights as Tom Cannon brought second-favourite Atlantic Grey to challenge, going clear over the last to win by four lengths from Miskin, who had every chance, but found little when asked to go and win the race. There was just one bid at the post-race auction, with Atlantic Grey being sold for the minimum price of £4,000 to Tony Saye and Cotton Club being claimed by Richard Mitchell for £6,000. Orchestrated had plenty of weight to carry in the PKF Francis Clark Conditional Jockeys’ Handicap Chase, but led over the last fence, only to be caught hallway up the run-in by the well-backed Bermeo, ridden by Rex Dingle. “I didn’t expect the horse to be so far back early on, but the jockey rode a well-judged race to get to the front where it mattered” said winning trainer Johnny Farrelly. Compatriot, wearing a tongue tie for the first time, added to trainer Olly Murphy’s impressive record at the course when getting up close home to deny favourite Rocket Ronnie, who had led into the straight, by a head in the concluding Racing Partnership Novices’ Handicap Hurdle. This was Warwickshire-based Murphy’s 27th winner of the season so far and he is well on track to beat last season’s score of 47, his first year with a license. The next fixture here is Friday 21st September. Tickets can be bought at our online ticket store until 10am on the day of the fixture and at the gates on the day.